While known mostly as a pathogen of wheat, corn, barley and other cereal grains, a species of fungus called Fusarium Graminearum turns out to be a treasure trove of potential new antibiotics and other natural compounds. In our homes and gardens, fungi are often unwelcome visitors, evidence of plant disease or rot and decay in damp places. They show up as black spots on tomato plants, discolored leaves on zucchinis and scabs on apples. Despite the benefits of these microorganisms — they are nature’s master recyclers — we spray and prune to get rid of them. 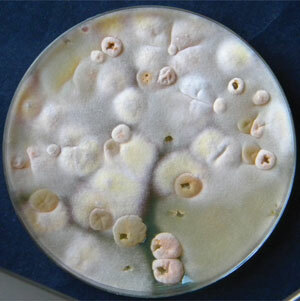 But in Michael Freitag’s lab, scientists work hard to grow fungi. 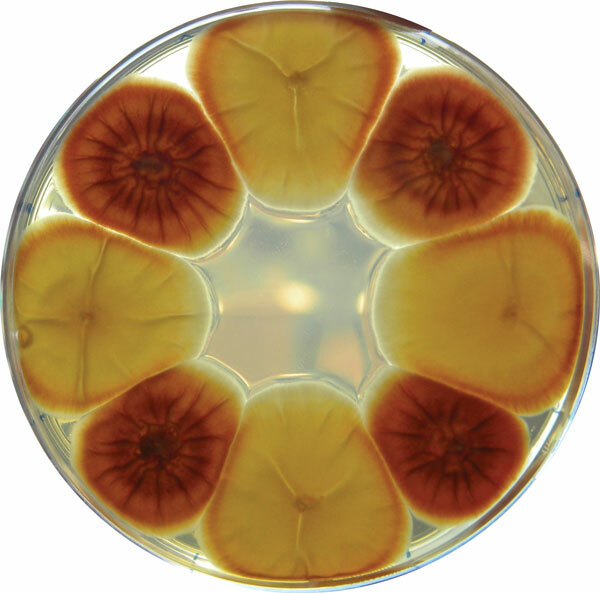 Student researchers feed fungal spores — the microscopic seeds of a new generation — with nutritious meals, swirl them gently in Erlenmeyer flasks, propagate fungal colonies in petri dishes and watch hopefully as stunning colors and curious shapes emerge. Freitag’s group has developed more than 400 strains of a species, Fusarium graminearum, that they keep preserved at a frosty minus 112 degrees Fahrenheit. Each strain is cataloged with a unique “FMF” number, shorthand for “Fusarium Michael Freitag,” and logged in a database. While known mostly as a pathogen of wheat, corn, barley and other cereal grains, this species turns out to be a treasure trove of potential new antibiotics and other natural compounds. In 2013, based on research conducted in part by undergraduates under the guidance of lab manager Lanelle Connolly, Freitag’s team announced that they had unlocked nearly 1,500 Fusarium genes, accounting for a large part, nearly 14 percent, of its total genome. In short, they have discovered a master switch that opens the door to new compounds with potential use in medicine, agriculture and industry. In nature, the genes that produce these compounds are normally inactive or “silent.” They do little more than get carried from one individual to another in the act of reproduction. “It’s likely,” says Freitag, an associate professor in the Oregon State University Department of Biochemistry and Biophysics, “that they are activated only under special circumstances, like a secret weapon.” They could help Fusarium to infect a plant host or to counter an attack by bacteria or other fungi. Until now, scientists have known almost nothing of the compounds that these genes produce. Despite their ubiquitous presence in the environment and even in our bodies, raising fungi takes extraordinary care. Connolly demonstrates the process by lifting a storage rack out of a freezer and, as vapors swirl about her head, she removes a sample smaller than a pea from a plastic microtube. She adds the sample to a broth of yeast extract, peptone (a protein mixture) and glucose (sugar) and places the liquid in a flask. On a shaker table — a platform that whirls flasks gently day and night — the fungus will multiply itself more than a million-fold. After several days, the flask holds more than 10 billion spores. The fungal population isn’t done growing. Student researchers filter the spores from the broth and inoculate them on a growth medium in petri dishes. For Fusarium, they often rely on carrots — organic, if you please. “You won’t believe how many batches of non-organic carrots cannot support fungal growth because the carrots are somehow treated,” says Freitag. Contamination by other microorganisms is a constant threat, so the students scrub countertops with bleach and sterilize their instruments with ethanol or steam and high pressure. After spending hours on developing their cells, it can be disappointing to find interlopers that spoil the broth. Moreover, the scientific method can be notoriously fickle. “Getting something to work once doesn’t mean it’s going to work all the time,” says Corinne Fargo, a member of Freitag’s team and a junior in the Department of Biochemistry and Biophysics and the University Honors College. For example, in a recent experiment, she succeeded in getting all 36 of her colonies to grow in petri dishes. “I rocked it,” she says. With colonies growing in petri dishes, researchers are ready for the next step. At this stage, the fungi share a curious feature: Each colony carries a foreign gene, called “neo,” that enables the fungus to detoxify two antibiotics — neomycin and an analog known as “G418.” In a petri dish that contains these antibiotics, fungi with the neo gene can do just fine. Three undergraduates are using their experience in Michael Freitag’s lab to prepare for medical school. The scientists use neo to trick the fungi into making new compounds. They do that by swapping it for the master-switch gene that they discovered in 2013. That gene, known by the scientific shorthand “kmt6,” is the same one that Connolly had shown to be responsible for controlling so much of the Fusarium genome. By growing these fungal colonies in the presence of an antibiotic (G418), Freitag’s group shows that neo is present and that kmt6 is indeed absent. However, without kmt6, a kind of biochemical anarchy prevails. Thousands of genes that were previously silent are now active, priming the cell’s machinery to produce new proteins. And the researchers notice other changes as well. The mutant grows more slowly and exhibits orange, yellow and pink colors. So the next challenge, says Freitag, is to begin sorting out the new order of gene regulation. And to do that, researchers rely on their own secret weapon: ultraviolet (UV) light. They expose the fungal colonies to a dose of UV that breaks DNA in unpredictable ways. To the casual observer, the device that delivers the dose — known as a “UV crosslinker” — looks just like a microwave oven. Unlike standard microwaves, UV damages DNA directly. The hope is that UV will cause more mutated strains to arise. By comparing them to colonies that had not been exposed to UV, Freitag’s team expects to begin unraveling the knot of new proteins and the genes responsible for making them. Freitag was surprised when his team discovered the kmt6 master switch, but the new findings show what can happen when students and laboratory scientists rub shoulders. Much of the current work is being done by Xiao Lan Chang and Phuong Pham, two Biochemistry and Biophysics undergraduates mentored by Connolly. Both students receive stipends to work in Freitag’s lab. “The best students are hard workers,” Connolly says. “I’m always most impressed if they have a positive attitude, a good work ethic and are academically inclined. That’s what we look for. And they do very well.” Previous students who worked in Freitag’s lab are now pursuing careers in medicine, biotechnology, government labs and academia. Freitag’s research program on the mechanisms of gene regulation is supported by the National Institutes of Health.